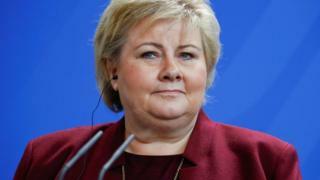 Norway's Prime Minister Erna Solberg has issu ed an official government apology to Norwegian women who were mistreated over World War Two-era relationships with German soldiers. The Germans were also encouraged to have children with them by Nazi leader Heinrich Himmler. Many were born in the German-administered Lebensborn (Fountain of Life) maternity facilities set up in the country from 1941 under SS directorship to promote "racial purity". Himmler, Adolf Hitler's deputy, favoured Norwegian women racially, and hoped they could help promote the Nazi concept of an Aryan master race. "Our con clusion is that Norwegian authorities violated the rule fundamental principle that no citizen can be punished without trial or sentenced without law." The apology was based on a report about Norway's post-war actions published by the country's Centre for Holocaust and Minority Minorities. More than seven d ecades on from the war, not many of the women directly affected are likely to still be alive to hear it. About 10-12,000 children are thought to have been born as a result of relationships betwee n Norwegian women and German soldiers. An 18-year-old student opened fire at fellow pupils, investigators in the Russia-annexed region say.